Breast Cancer is treated within GWCC’s Breast Cancer Program. Breast cancer is cancer that forms in the cells of the breasts. Breast cancer can be a scary topic for women. For many, even getting an annual breast cancer screening can be an unsettling experience. That's why the GW Comprehensive Breast Center offers a comfortable, serene spa-like setting where women can receive a variety preventive, diagnostic and treatment services for breast cancer. The Breast Cancer Program at the GW Cancer Center provides multi-disciplinary breast care services for the early detection, diagnosis and treatment of breast cancer using state-of-the-art technologies unavailable at any other breast center in the Washington, D.C. metro area. Staffed by nationally and internationally-renown physicians and surgeons who care only for breast, the Breast Cancer Program at the GW Cancer Center offers women quality medical care along with advanced imaging and diagnostic technology. GW Cancer Center’s Breast Cancer Program is a unique program in the D.C. area. It is run by specialists who focus only on breast health. Our specialists include three female breast surgeons, six breast imaging specialists and three breast cancer doctors. We are the only program in the area to offer new screening methods that can diagnose cancer early. Patients are seen in our comfortable, soothing clinic environment designed to bring peace of mind. Our breast cancer doctors are dedicated to better understanding breast cancer. We offer clinical trials for patients with most types of breast cancer. As a result, even women with aggressive cancers are more likely to survive. We also have a program for individuals at a higher risk for breast cancer. We are focused on identifying, counseling and treating women who have genetic mutations. These mutations could lead to breast cancer. Women can take a two-minute screening test to identify whether they are at for breast cancer. The Breast Cancer Program provides complete care for each patient. A team of physicians from different specialties come together to discuss each new breast cancer case. They create a treatment plan that will best serve the patient. All breast cancer services are in one clinic setting. This approach makes it more convenient for patients to see many specialists in one visit. Our high-risk program is among the best in the nation. Every month, multiple specialists meet to discuss patients who have a genetic mutation. They work together to agree on a treatment plan. Following the conference, the patient can see all the specialists in the same afternoon. After a breast cancer diagnosis, patients are guided through the process by a patient navigator. This person helps break down every barrier to care. They respond to patient questions and concerns. The navigator partners with patients to ensure they get every exam and every treatment in a timely matter. We provide meaningful comfort measures to patients. These include physical therapy, reiki, massage and support. Soon, we will offer a new procedure that helps to prevent hair loss in patients undergoing chemotherapy treatments. Our research program is growing to include more investigator-initiated clinical trials. We have clinical trials available for every stage of diagnosis. We are studying new ways to determine if any cancerous cells remain at the edge of a removed breast tumor. This will help surgeons make sure they completely remove every trace of cancer. As a result, cancer is less likely to come back. Some abnormal breast cells could develop into cancer. By studying the genetic makeup of these cells, we can better understand which types will lead to breast cancer. And we can manage them before they do. We continue to study the characteristics of the breast cancer gene. The more we know about this gene, the better able we are to identify breast cancers in the earliest stages. We offer a unique approach for deciding which screening method will be best for each patient. Rather than simply using mammography for everyone, we look at the patient’s breast density. We also consider risk factors, like family history. Since we use the best screening approach for each patient, we can identify significantly more cancers. Every biopsy we perform is done minimally invasively in a safe outpatient setting. There is no need to go to the operating room for a breast cancer diagnosis. We are committed to offering advanced imaging to patients diagnosed with breast cancer. 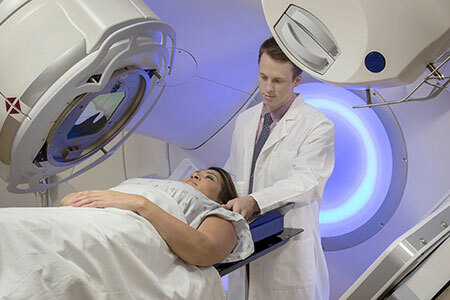 Molecular breast imaging and magnetic resonance imaging (MRI) give us the best chance of detecting cancer in other areas of the breast or body in its earliest, most curable state. Our dedicated plastic surgeons offer excellent cosmetic outcomes. We offer reconstruction using the patient’s own tissue (flaps). We even offer a rare flaps procedure that uses tissue from body parts other than the belly. As a result, virtually every woman can now have an advanced reconstructive procedure. We often refer women and their family members for genetic counseling. Understanding cancer genetics takes expert training. When it comes to treatment, our cancer geneticists use testing known as molecular profiling. It helps them to better understand the specific tumor, and what treatments work best for that tumor type. We are the only program in the area to offer molecular breast imaging. This nuclear imaging technology can identify active cancer cells to find ten percent more tumors. Magnetic resonance imaging (MRI) can be used for both diagnosis and staging of breast tumors. It is a helpful tool for women at a higher risk for breast cancer. Automated whole breast ultrasound is a radiation-free, non-invasive approach. It uses sound waves to create a three-dimensional picture of the breast. Our Mammovan is the heart of our mobile mammography program. It brings state-of-the-art mammogram screening to underserved women in the region.